This was another video by Justin Atkin, aka The Thought Emporium. He has started down a long path which will hopefully lead to the creation of a strain of yeast which will produce spider silk. 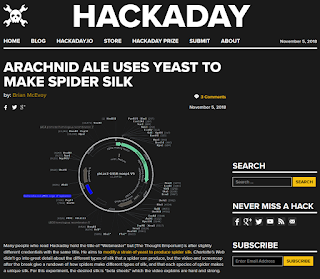 The video was a little over my head on some points, but I picked up on the major points as he went through the different types of silk spiders produce and his approach to modifying the yeast.